Advances in High Temperature Chemistry, Volume 3 reviews and evaluates some techniques in high temperature chemistry. 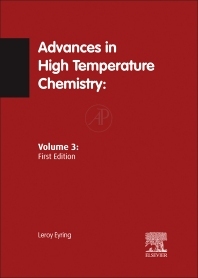 Comprised of six chapters, this volume first discusses the principles concerned with high temperature chemistry. After introducing short-range ordering in crystals, this book shows how to interpret liquid alloy activity measurements. It also covers various techniques such as photoionization mass spectroscopy, photoelectron spectroscopy, and microwave spectroscopy. This book ends with a discussion on oxahalides and other transition elements. Researchers and high temperature chemists will find this book useful.